Cellulophaga algicola Bowman 2000 belongs to the family Flavobacteriaceae within the phylum ‘Bacteroidetes’ and was isolated from Melosira collected from the Eastern Antarctic coastal zone. The species is of interest because its members produce a wide range of extracellular enzymes capable of degrading proteins and polysaccharides with temperature optima of 20–30°C. This is the first completed genome sequence of a member of the genus Cellulophaga. 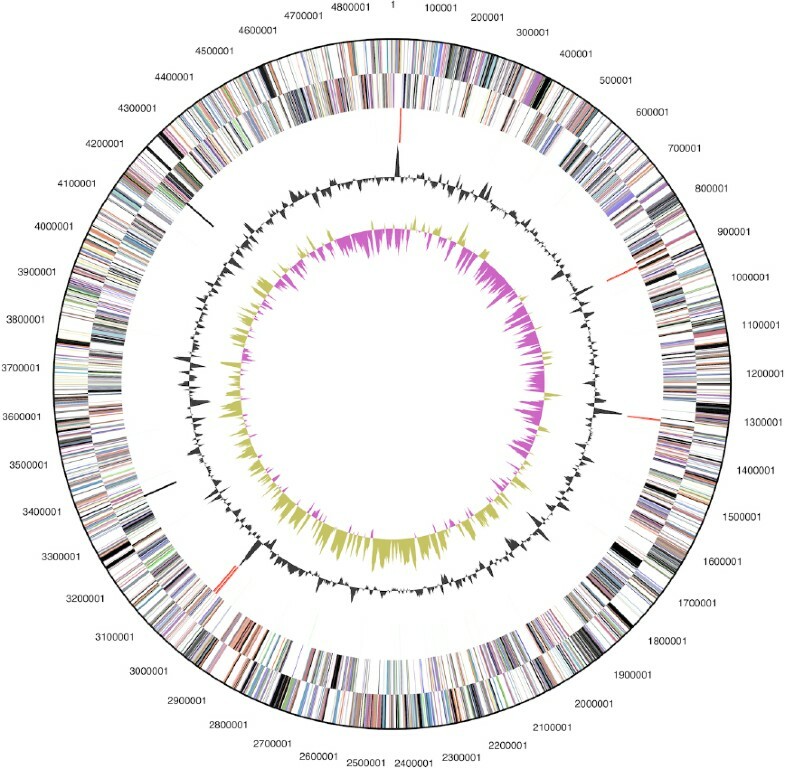 The 4,888,353 bp long genome with its 4,285 protein-coding and 62 RNA genes consists of one circular chromosome and is a part of the Genomic Encyclopedia of Bacteria and Archaea project. Strain IC166T (= DSM 14237 = CIP 107446 = LMG 21425) is the type strain of C. algicola, which belongs to the family Flavobacteriaceae within the phylum ‘Bacteroidetes’. The strain was isolated from the surface of the chain-forming sea-ice diatom Melosira collected from the Eastern Antarctic coastal zone, and was described by Bowman in 2000 . Currently, there are six species placed in the genus Cellulophaga, namely C. algicola , C. baltica, C. fucicola, C. lytica , C. pacifica  and C. tyrosinoxydans . C. lytica is the type species of the genus Cellulophaga . The generic name of the genus derives from the Neo Latin word ‘cellulosum’ meaning ‘cellulose’ and the Greek word ‘phagein’ meaning ‘to eat’, referring to an eater of cellulose. Here we present a summary classification and a set of features for C. algicola IC166T, together with the description of the complete genomic sequencing and annotation. A representative genomic 16S rRNA sequence of C. algicola was compared using NCBI BLAST under default settings (e.g., considering only the high-scoring segment pairs (HSPs) from the best 250 hits) with the most recent release of the Greengenes database  and the relative frequencies, weighted by BLAST scores, of taxa and keywords (reduced to their stem ) were determined. 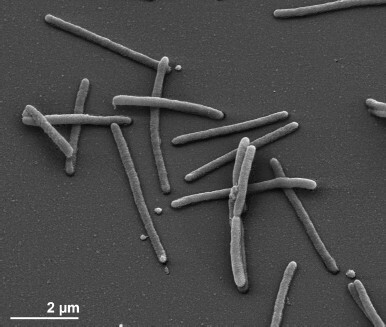 The five most frequent genera were Cellulophaga (39.5%), Maribacter (7.8%), Flavobacterium (5.6%), Cytophaga (5.4%) and Formosa (4.7%) (135 hits in total). Regarding the 21 hits to sequences from members of the species, the average identity within HSPs was 95.8%, whereas the average coverage by HSPs was 94.9%. Regarding the 16 hits to sequences from other members of the genus, the average identity within HSPs was 94.7%, whereas the average coverage by HSPs was 94.7%. Among all other species, the one yielding the highest score was C. baltica, which corresponded to an identity of 98.1% and a HSP coverage of 97.8%. The highest-scoring environmental sequence was GU452686 (‘sediments coast oil polluted Black Sea coastal sediment clone 70SZ2’), which showed an identity of 96.5% and a HSP coverage of 98.1%. The five most frequent keywords within the labels of environmental samples which yielded hits were ‘marin’ (4.7%), ‘water’ (4.3%), ‘sediment’ (4.3%), ‘sea’ (3.5%) and ‘coastal’ (2.6%) (115 hits in total). Environmental samples which yielded hits of a higher score than the highest scoring species were not found. 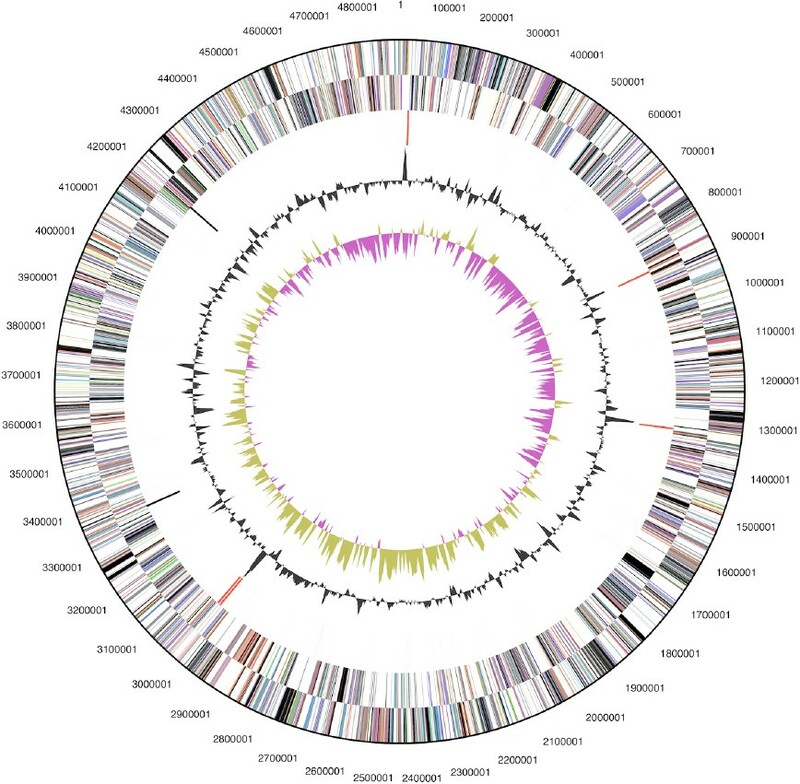 The environmental samples database (env_nt) contains the marine metagenome clone ctg_1101667042524 (AACY022635173) isolated from Sargasso Sea near Bermuda, sharing 92% identity with IC166T  (as of January 2011). Figure 1 shows the phylogenetic neighborhood of C. algicola IC166T in a 16S rRNA based tree. The sequences of the five 16S rRNA gene copies in the genome differ from each other by up to two nucleotides, and differ by up to 14 nucleotides from the previously published 16S rRNA sequence (AF001366), which contains nine ambiguous base calls. Phylogenetic tree highlighting the position of C. algicola IC166T relative to the other type strains within the family Flavobacteriaceae. The tree was inferred from 1,458 aligned characters [8,9] of the 16S rRNA gene sequence under the maximum likelihood criterion  and rooted in accordance with the current taxonomy. The branches are scaled in terms of the expected number of substitutions per site. Numbers above branches are support values from 350 bootstrap replicates  if larger than 60%. Lineages with type strain genome sequencing projects registered in GOLD  are shown in blue, published genomes in bold. The cells of C. algicola are generally rod-shaped with rounded or tapered ends with cell lengths and widths ranging from 1.5 to 4 and 0.4 to 0.5 µm, respectively (Figure 2 and Table 1). C. algicola is motile by gliding . Colonies on marine 2216 agar have yellow-orange pigmentation and a compact center, with a spreading edge possessing lighter pigmentation. Their consistency is slimy and they are slightly sunken into the agar . Flexirubin pigments are not formed. C. algicola grows between 0.5 and 10% NaCl, with the best growth in the presence of about 2% NaCl. The temperature range for growth is between -2°C and 28°C, with an optimum between 15–20°C on solid media and at about 20–25°C in liquid media . The optimal pH for growth is about 7.5 . Classification and general features of C. algicola IC166T according to the MIGS recommendations . The organism is strictly aerobic and chemoorganotrophic . C. algicola can hydrolyze agar, starch, gelatine, carboxymethylcellulose (CMC), casein, Tween 80, tributyrin and L-tyrosine, but not urate, xanthine or dextran, when grown in presence of 1% L-tyrosine a reddish-brown diffusible pigment is formed . Nitrate reduction is positive, whereas denitrification, H2S production and indole production are negative [1,18]. Acid is formed oxidatively from D-galactose, D-glucose, D-fructose, sucrose, cellobiose, lactose and mannitol. Strain IC166T is sensitive to ampicillin, streptomycin and carbenicillin and shows resistance to tetracycline . The fatty acid profile of seven Antarctic strains, including strain IC166T, was analyzed by Bowman in 2000 . The hypothetical median representative of the Antarctic isolates was published. The predominant cellular fatty acids of these seven strains were branched-chain saturated and unsaturated fatty acids and straight-chain saturated and mono-unsaturated fatty acids, namely iso-C15:0 (7.5%), iso-C15:1ω10c (7.5%), iso -C17:1ω7c (6.1%), C15:0 (14.3%), C16:1ω7c (19.2%), iso -C15:0 3-OH (8.6%), iso-C16:0 3-OH (6.5%) and iso -C17:0 3-OH (4.5%) . The isoprenoid quinones of C. algicola were not determined, but for C. pacifica the presence of MK-6 as the major lipoquinone was described . Polar lipids not have been studied. C. algicola IC166T, DSM 14237, was grown in DSMZ medium 514 (BACTO marine broth)  at 15°C. DNA was isolated from 0.5–1 g of cell paste using MasterPure Gram-positive DNA purification kit (Epicentre MGP04100) following the standard protocol as recommended by the manufacturer with modification st/DL for cell lysis as described in Wu et al. . DNA is available through the DNA Bank Network . The genome consists of a 4,888,353 bp long chromosome with a GC content of 33.8% (Table 3 and Figure 3). Of the 4,347 genes predicted, 4,285 were protein-coding genes, and 62 RNAs; 122 pseudogenes were also identified. The majority of the protein-coding genes (59.5%) were assigned with a putative function while the remaining ones were annotated as hypothetical proteins. The distribution of genes into COGs functional categories is presented in Table 4. A closer look on the genome sequence of strain IC166T revealed a set of genes which might be responsible for the yellow-orange color of C. algicola cells by encoding enzymes that are involved in the synthesis of carotenoids. Carotenoids are produced by the action of geranylgeranyl pyrophosphate synthase (Celal_1770), phytoene synthase (Celal_2446), phytoene desaturase (Celal_2447), lycopene cyclase (Celal_1771) and carotene hydroxylase (Celal_2445). Geranylgeranyl pyrophosphate synthases start the biosynthesis of carotenoids by combining farnesyl pyrophosphate with C5 isoprenoid units to C20-molecules, geranylgeranyl pyrophosphate. The phytoene synthase catalyzes the condensation of two geranylgeranyl pyrophosphate molecules followed by the removal of diphosphate and a proton shift leading to the formation of phytoene. Sequential desaturation steps are conducted by the phytoene desaturase followed by cyclisation of the ends of the molecules catalyzed by the lycopene cyclase . Strain IC166T produces a wide range of extracellular enzymes degrading proteins and polysaccharides. These enzymes are cold adapted, they have temperature optima between 15–30°C and can tolerate temperatures below 0°C . For that reason they are of special interest for industrial and biotechnical applications. C. algicola like the other members of the genus Cellulophaga, cannot hydrolyze filter paper or cellulose in its crystalline form, though they can hydrolyze the soluble cellulose derivative carboxymethylcellulose (CMC). The genome sequence of strain IC166T revealed the presence of three cellulases (Celal_0025, Celal_2753, Celal_3912), probably responsible for the hydrolysis of CMC. In addition two β-glucosidases (Celal_0470, Celal_1802) were identified in the genome, catalyzing the break down of the glycosidic β-1,4 bond between two glucose molecules in cellobiose. The IC166T genome contains 22 genes coding for sulfatases, which are located in close proximity to glycoside hydrolase genes suggesting that sulfated polysaccharides may be used as substrates. α-L-fucoidan could be a substrate, as five α-L-fucosidases (Celal_2459, Celal_2466, Celal_2469, Celal_2470, Celal_2473) are located in close proximity to three sulfatases (Celal_2464, Celal_2468, Celal_2472). Sakai and colleagues report the existence of intracellular α-L-fucosidases and sulfatases, which enable ‘Fucophilus fucoidanolyticus’ to degrade fucoidan . This fucoidan degrading ability could be also shared by Coraliomargarita akajimensis, as the annotation of the genome sequence revealed the existence of 49 sulfatases and twelve α-L-fucosidases . In addition, three β-agarases (Celal_2463, Celal_2494, Celal_3979) were identified, with two of them located in the above mentioned region, which is rich in genes encoding glycoside hydrolases and sulfatases. We would like to gratefully acknowledge the help of Regine Fähnrich (DSMZ) for growing C. algicola cultures. This work was performed under the auspices of the US Department of Energy Office of Science, Biological and Environmental Research Program, and by the University of California, Lawrence Berkeley National Laboratory under contract No. DE-AC02-05CH11231, Lawrence Livermore National Laboratory under Contract No. DE-AC52-07NA27344, and Los Alamos National Laboratory under contract No. DE-AC02-06NA25396, UT-Battelle and Oak Ridge National Laboratory under contract DE-AC05-00OR22725, as well as German Research Foundation (DFG) INST 599/1-2. Classification of Bacteria and Archaea in risk groups. http://www.baua.de.